Far too many children suffer child sexual abuse, and far too many adults aren't aware or don't know how to help prevent it. Teach your children about the difference between good touch and bad touch. Teach and use the proper names for body parts. Set and respect family privacy boundaries. Tell your child it's OK to say "no" to an adult. Be aware of and set limits on your child's use of technology. Let your children know you'll support them when they request privacy or say no to an activity or type of touch that makes them feel uncomfortable. 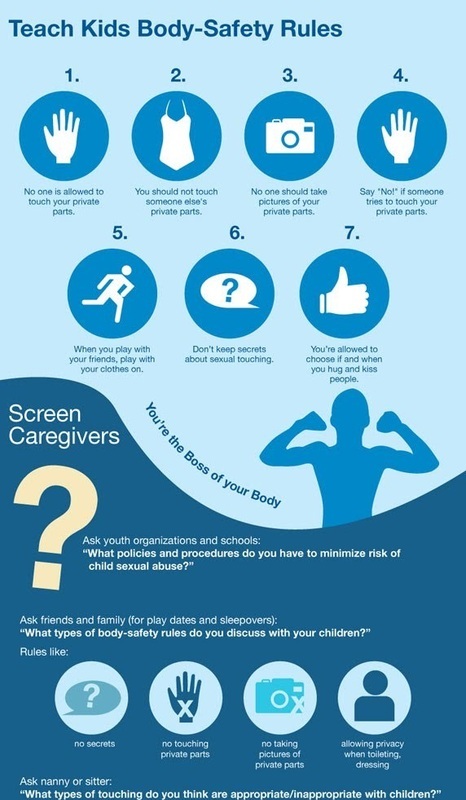 Encourage your children to confide in a "safe adult" (school counselor, grandparent, trusted family friend, etc.) if they feel they can't talk to you. It’s normal to feel uneasy about broaching the topic of sexual abuse with your kids, but talking about it helps keep them safe. Watch this video to get four important tips on how to start the conversation and download the conversation guide for more helpful tips.